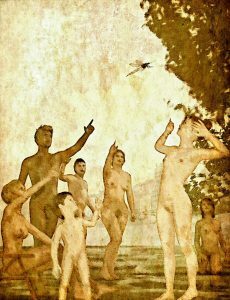 What is ‘Naturist’ / ‘Nudist’ Art? New technology is always coming along and changing how we do things. One hundred years ago dial telephones, short wave radios, and arc welders were new; now we talk of artificial intelligence, flying suits, delivery drones, and electric semi-trucks. The world of art moves with the new technology. Print-on-demand and digital editing are enabling art in ways very reminiscent of photography and offset printing. As much as some things change, some things stay the same. Flowers, children, nudes, and landscapes still dominate the art world, as both consumers and producers of art strive to express themselves. As long as viewers and makers take pleasure in these themes we can expect that painters and others will continue to make them. If you want this art to hang on your wall, I can discuss that with you. Send me a message and we will negotiate.